Whey C-6 is a mega-anabolic preparation of high-protein (85% protein in the dry matter, BV 104 - 159) contains a unique set of whey protein: WPI (isolation methods: filtration, ion-exchange chromatography and cross), ultrafiltrated WPC and WPH, which provides the body Athlete highest dose of essential amino acids (50%) in the BCAA (25%) and in particular leucine - an amino acid essential to stimulate the synthesis of new muscle proteins. 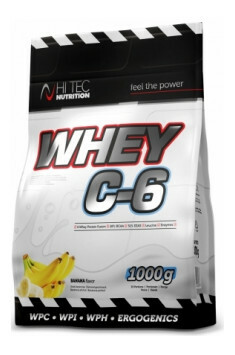 Whey C-6 also has been enhanced in the anabolic amino acids: L-leucine and L-glutamine and enhancing substances digestion and absorption of proteins (proteolytic enzymes from pineapple and papaya) and β-ecdysterone, which often increases the use of amino acids by the muscle to produce proteins. Whey C-6 is rapidly absorbed protein, as early as 15 minutes after drinking the amino acid nutrients pass from the intestine into the bloodstream. Thanks so very rapidly absorbed, the formulation effectively improves the overall nitrogen balance in the body and contributes to a significant increase in strength and lean muscle mass. In addition, the high content of glutamine, amino acids and bioactive peptides sulfur exhibits immunostimulatory activity and enhances the antioxidant defense of cells which provides the body with an athlete faster recovery after training and thus the opportunity to train at a much higher level and with greater frequency. The use of the enzyme - lactase Whey C6 is much better tolerated by persons with no problems digesting lactose present in the dairy products. Mixture of proteins (consisting of: ultra filtrated whey protein concentrate, soy protein isolate (without GMO), whey protein isolate) (98% for all flavors except: 93% for chocolate flavor), low fat cocoa powder (for chocolate flavor) , nutty, cakes with cream), aroma, acidity regulator (citric acid), sweetener (acesulfame K, sucralose), emulsifier: lecithin, dyes: red beetroot powder (for strawberry flavor).